African Minerals Development Centre – launch of a milestone for making good use of minerals for Africa’s development? Developing Resources – Resource Curse or Resource Blessing? Africa and China: It's all about pragmatism silly! Africa's industrialisation is not a choice, it is an imperative! GREAT insights - From Growth to Transformation: What Role for the Extractive Sector? Talking about the impact of private sector development, are we using the same language? San Bilal, Bruce Byiers and Anna Rosengren facilitated this meeting. Jean Bossuyt and Isabelle Ramdoo participated in this seminar. This second informal meeting was organised by ECDPM and DCED and was attended by representatives from the private sector, donors, partner government representatives and civil society. This informal meeting was attended by representatives from the private sector, donors, partner government representatives and civil society. ECDPM's Isabelle Ramdoo and San Bilal were co-organisers of this event and San Bilal provide introductory remarks at the meeting (press release). Kathleen van Hove, Jan Vanheukelom, Bruce Byiers and Pamela O'Hanlon attended this event which was organised by ECDPM in partnership with SAIIA. Bruce Byiers attended this event. Jan Vanheukelom attended this event. San Bilal was a discussant at this meeting. Jeske van Seters and Quentin de Roquefeuil attended this meeting. Camilla Rocca attended this conference. 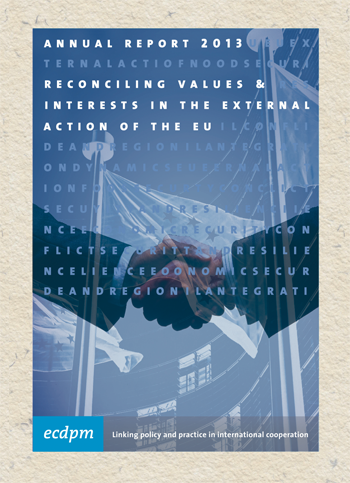 Africa-EU: Dialogue and Negotiations in Global Fora - "Collaboration for Win-Win Negotiations in Multilateral Fora?" Geert Laporte facilitated this meeting. Isabelle Ramdoo attended this meeting. Anna Rosengren attended this meeting. Bruce Byiers spoke at this event. Florian Krätke presented Briefing Note 55 on blending loans and grants for development at this event. San Bilal moderated this event. Bruce Byiers and Kathleen Van Hove attended this event. Anna Rosengren attended this event. Isabelle Ramdoo presented at this event. Bruce Byiers attended this conference. San Bilal attended this event. Kathleen van Hove attended this event. Isabelle Ramdoo attended this event. Looking Beyond 2013: Are EU-Africa Relations Still Fit for Purpose? Paul Engel, Geert Laporte and Faten Aggad-Clerx participated in this high-level conference. San Bilal spoke at this meeting. San Bilal spoke at this event. San Bilal attended this meeting. Isabelle Ramdoo attended these meetings. Raw materials: a raw deal for developing countries? San Bilal participated in this event. Brussels Briefing on " Drivers of Agricultural transformation in Africa"
Jeske van Seters, Bruce Byiers and Bastiaan van Helden attended this meeting. Paul Engel gave a presentation at this meeting. Bruce Byiers was a discussant at this meeting. Brecht Lein attended this event. Isabelle Ramdoo attended this meeting and made a presentation. Bruce Byiers attended this meeting. Isabelle Ramdoo and San Bilal attended this meeting where the African Economic Outlook Report: Structural Transformation and Natural Resources was launched. San Bilal gave a presentation on 'Engaging the Private Sector for Development' at this event. San Bilal and Isabelle Ramdoo attended this event. San Bilal and Quentin de Roquefeuil attended this event. During this event, Quentin de Roquefeuil attended the Committee meeting on Economic Development, Finance and Trade on 15 June and the meeting on EPAs on 17 June. San Bilal has moderated the workshop on Business on 16 June for the Irish Presidency and attended the meetings on 17 June. Quentin de Roquefeuil attended this meeting. ACET seminar "Challenges and Potentials of African Economic Transformation"
Sahra El Fassi attended this event. ECDPM’s Geert Laporte was on the panel on the future of the ACP and San Bilal was on the panel discussing EPAs with EC Chief EPA negotiator Peter Thomson and Xavier Carim, South Africa’s Chief negotiator. Isabelle Ramdoo presented at this conference. Bruce Byiers and San Bilal attended this seminar. San Bilal gave a presentation on ''The impact of trade policy on development (and the role of impact assessment instruments)'' at this event. San Bilal attended this seminar. Isabelle Ramdoo attended and participated in this seminar. Bruce Byiers attended this Development Policy Forum Roundtable. San Bilal made a presentation of this draft note at the event. Dan Lui, ECDPM Programme Associate, gave a presentation on a forthcoming study on Regional Aid for Trade and Corridors. Isabelle Ramdoo attended this meeting. Please find here the presenters and agenda for this meeting. Paul Engel and Jean Bossuyt attended this event and Jean Bossuyt gave a presentation. Isabelle Ramdoo and San Bilal attended this meeting. The UNECA, African Development Bank Annual Report on economic transformation and mineral resources was launched at this meeting. Bruce Byiers and Anna Rosengren attended this event. Paul Engel and Bruce Byiers participated in this seminar that addressed Development Banks, ODA and the Aid architecture and the UN and the UN Development Agenda. Bruce Byiers gave a presentation at this meeting as keynote speaker. Bruce Byiers attended this meeting which brought together a wide range of stakeholders from developing and developed countries to discuss how to continue delivering aid for trade results in a changing international environment for trade and development.